VQ35DE oil - Mobil 1 full synthetic? Re: VQ35DE oil - Mobil 1 full synthetic? Wow. Low mileage for an 07. I ran Mobil 1 5W-30 for a while and then at the end switched to 0W-40...no issues. Paired it always with an M1-110 Mobile 1 filter. 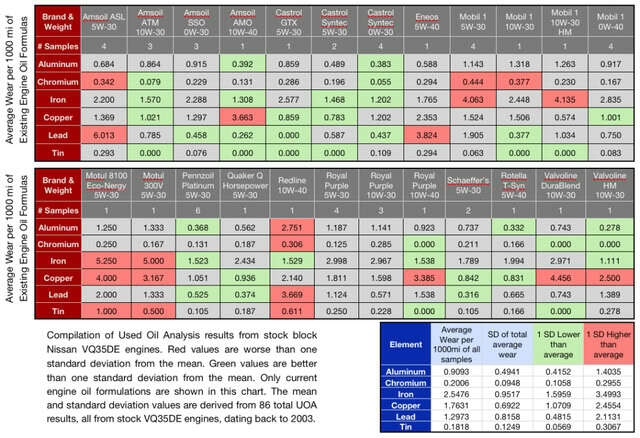 Based on this oil analysis for a VQ35DE, I run Castrol Edge High Mileage Full Synthetic. It seems that the Castrol formulas seem to match up with the ring, bearing, cam and valve guide materials engine best. Thank you. Yes low miles and really enjoing it so far. That's a very good visualization, thanks for sharing. There might be a lot of things to control for such as engine mileage, fuel used, driving habits etc, but to get 86 people to collaborate for the good of the community is pretty impressive. Many have had significant oil burning when they switched to synthetic. So be sure and check your oil levels every 1k miles during this oil change period to make sure you are running ok. Brand and weight of the synthetic makes a difference though on people burning oil or not. My Castrol Edge High Mileage Full Synthetic seems to be working great so far, Royal Purple was terrible for me. I have been using Mobil-1 5W30 since forever. My 09 M35 with the HR (dual intake) engine is now 10 years old with 107k miles. I changed to the Mobil-1 for high mileage formula after about 80k miles. No noticeable oil loss from one change to the next. Oil level per dipstick seems to always be in the same place. However, I never 'race' (but I will ignore speed limits on motorways when it's comfy to do so), and the car lives near the bottom of Florida so no significant temperature changes and I change air filters regularly, change coolant, gear box and differential fluids as required. Perhaps I have an advantage due to location and maintenance. I have heard great things about Pennzoil Ultra and Castrol Edge but since I seem to be doing fine with Mobil, I see no reason to change. In other forums that also talk about the VQ35 engine (like my350z.com) oil analysis they see good numbers with Mobil 1 0w-40. I used to use that but I have switched to Rotella 5w-40 since it's a heavier duty oil for more "severe" stressed engines. I autocross my 350z and the g37 is beat on frequently. I will also start putting this into my daily (m35).